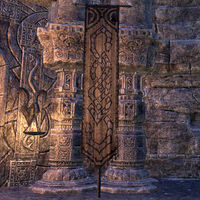 The Scaled Court is a group of fanatics active in Craglorn and Western Cyrodiil. They follow the teachings of the Celestial body The Serpent. The were initially led by the Nord warlord, Milvern One-Sword, and emerged at the mysterious disappearance of the Celestial Guardians in the night sky in 2E 582. They were driven from Cyrodiil by the Imperial Legion, but they were still active in Craglorn. They were disbanded after being defeated by The Soulless One. This page was last modified on 9 April 2019, at 22:19.